To provide exceptional youth hockey players the opportunity to develop advanced individual and team skills by playing with and against players and teams of equal or superior skill. The Minnesota Blades AAA Hockey Club is a non-profit youth hockey association that originated in 1989, initially as the Minnesota Stars. The founders, John Arko and Dennis Postregna, wanted to give talented Minnesota youth hockey players the opportunity, in the off-season, to travel outside the state and country to compete at the Tier I level --- experiences not normally available to Minnesota players during the regular season. They started with two select teams, playing hockey across Europe with 1976 and 1977 birth years players. Since then, the organization has grown to include boys and girls teams from Mites to Midgets, ages nine to nineteen. Funding for the Blades activities comes from parents, corporate sponsors, and the annual Blades-sponsored Spring AAA tournament, the Minnesota Super Series. Part of the Blades philosophy is that the best competition challenges players to be their best. The strength of this concept lies in the belief that highly skilled players, playing with others of similar skills, are able to learn more about teamwork and the game of hockey, because their coaches are teaching a team of players who can all execute and understand at the same level. Blades coaches stress skill and systems development, play making and teamwork. The tournaments that Blades teams participate in are selected based on the strength of the competition, the dates, and the location. To assess the success of the Blades program, check out the ever-expanding list of our alumni accomplishments. Excellent coaching, highly-competitive tournaments, and international travel all serve to "stretch" Blades players' abilities and attitudes, building self esteem in a variety of areas. The tournament travel experience alone can be extraordinarily educational. Playing in a hockey tournament in Toronto, for instance, will still allow our young players time to visit the Hockey Hall of Fame, or to have lunch at Gretzky's restaurant. In Boston, they may have the opportunity to see a Red Sox game or visit the Harvard campus. Every aspect of the Blades schedule, from player selection to practices to competition, is designed to help the individual improve as a hockey player. Additional benefits include the expansion of life experience and the development of self-confidence, all while having fun with their friends! 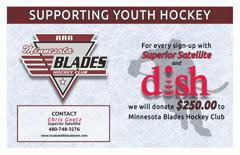 Thank You MN Blades Sponsors! The Blades have helped more than 350 Minnesota kids obtain Division I scholarships, and more than a quarter of these players have moved on to professional hockey. This is accomplished in three ways: 1) At the youth level, the Blades develop players through years of coaching and development; 2) At the high school level, the Blades help players gain national exposure by playing in the most highly scouted tournaments around North America; 3) Finally, at the older level, the Blades are able to use their vast contacts with Division I colleges/universities and USHL/NAHL scouts to promote their players to the next level. Funding for the Blades activities comes from parents, corporate sponsors, and the annual Blades-sponsored Spring AAA tournament, the Minnesota Super Series. Now more than ever, as tournament fees and equipment costs rise, the Minnesota Blades are relying on sponsorships and donations to help ensure that participation in the Minnesota Blades remains affordable for all. Your generosity is appreciated and we thank you in advance for helping make the Minnesota Blades a continued success. For additional information, please contact Jaime Fransway, Executive Director at 612-990-9355 or jaime@minnesotablades.com. Visit our Facebook Page .... Click on Link Below. You can view & share team news & photos. If you "Like" the page, you will receive posts on your Facebook News Feed. to donate & support Jack and his future needs. Gentry Fall Showcase kicks off. Gentry 03 defeats Omaha 10-0. Sioux Falls 3-1 over Gentry 02/03. 03 Great Plains over Madison 3-1. RT @WEHPscout: @mnhhcom @MinnesotaBlades @2003MNBlades Chaz Lucius one of our highest ranked 03s for the WHL region for Americans. ©2019 The Minnesota Blades / SportsEngine. All Rights Reserved.